Almost two thousand students have now taken at least one of my online courses. Below are some of their words about their experience as well as videos and photos of their work. Trust that what you need to see will come forward out of this long list. I am grateful for every one of these hard-working people. It is a joy to see their work and hear their voices every day. I am absolutely loving this course. I have been doing a lot of online research and looking at lots of tapestries wondering “how did they do that?” The more I learn the more excited I get. Yesterday I pulled out my Hokett loom that had been warped for over a year. I proceeded to weave my header. What a peaceful feeling it gave me. Each time I took my little fork and beat it down it took my breath away. ...I began to think I could learn something from tapestry and tapestry weavers and contacted a few friends who are experts in tapestry. It seemed like everyone kept pointing me to Rebecca Mezoff and her online tapestry courses... What works for me, besides the fact that she has made professional videos that are in focus, clear to follow, and funny, is that these are self-directed courses.... you work at your own speed, whenever you want, and you can ask as many questions as you want.... What I was totally unprepared for was my reaction to doing tapestry. I was completely mesmerized and engaged and loved it. --Bhakti Ziek on her blog. Read the entire post HERE. 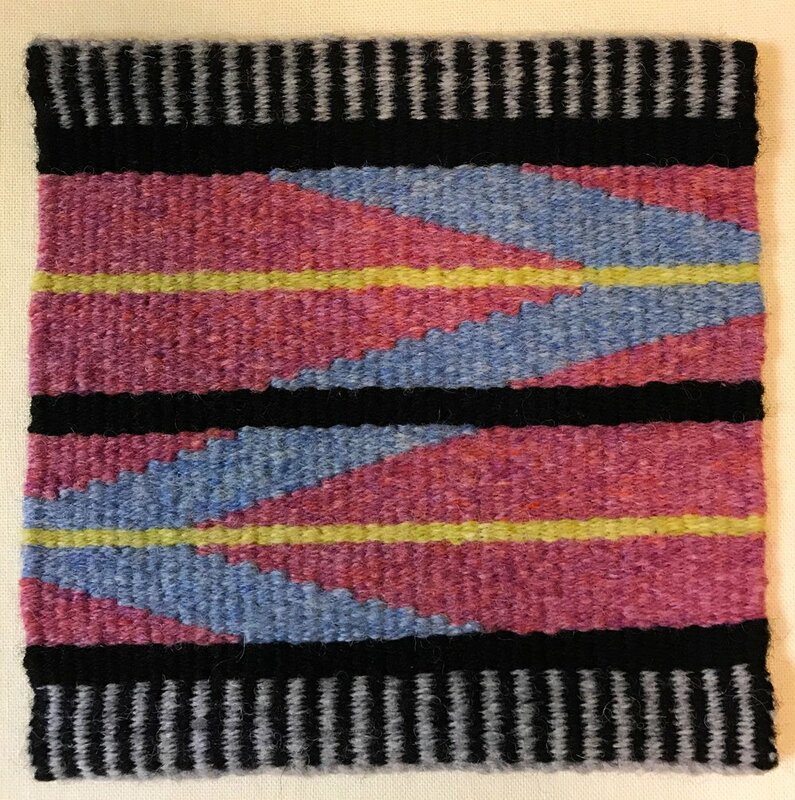 A testament to Rebecca’s teaching - I sent some images of my weavings to West Dean College, and guess what? I have been accepted as one of seven students to participate in their 24 month, part-time, Intermediate Tapestry development course…. We will be working in their renowned tapestry studio!! I never really dreamed my work could be good enough for this, and to be there will be wonderful. [Your course] has motivated me to actually weave in a way that none of the books I have bought over the years have done. Your course is well-organized and filled with important and inspiring information. The videos are terrific. It is so helpful to be able to watch them over and over, hopefully absorbing some of your good weaving habits. Your response time is great, and your feedback is always enthusiastic and helpful. Tapestry is FUN... especially when you have a teacher! ...I had heard about Rebecca Mezoff and her online classes, but I was a tad skeptical. How was THAT going to work out??? ...I have to say it was the BEST decision! I am SO EXCITED! --Sierra of Dakota Designs on her blog. You can read the whole post HERE. --Michiele on her blog, Knit on Regardless. You can see the whole post HERE. My only hesitation about taking this class was my lack of intuitiveness when it comes to technology. Technology things that seem obvious to younger people are never obvious to me. If I can make something difficult, I usually find a way. I found the Pathwright platform to be simple and easy to use. Hi Rebecca, I thank you out of the bottom of my heart that you had the patience for me to complete this course. I have already great ideas... The course is really easy to follow from start to finish. You must have put so many hours in. Thank you for all you do. Rebecca-I am a shoot-from-the-hip kind of person. I am aware you don't know me, but trust me when I say "I tell it like it is". I love the workshop "Color Gradation". It is the boost I need to get going. I may have forgotten some things from 20 years ago, but I will slap my forehead and say "Duh!" several times as I watch the video... I am leaning into the computer, absorbing the bits and things I need, and I am concentrating on everything. You did a beyond amazing job on the presentation and the examples and well-EVERYTHING! ...You did a wonderful job. Thanks for doing this. This is the class I needed. Have to admit that I was a little nervous about online learning but I am hooked into your classes. I love being able to work at my pace….sometimes a few minutes in a day, or sometimes, most of the day. This was is an advantage to me and I don’t feel the ‘sensory overload’ that I get when taking a 3-day workshop. Rebecca there is a challenge I have found with your online class! I want more of your videos, more of your downloads, more of learning at my own pace, more enjoying the journey and not wanting it to end! Yes, I know there two more parts.......but then what???? You are very gifted at teaching your craft and allowing your students the freedom to learn under your watchful eyes. Please consider adding more classes in the future. I want, no make that NEED more...........to continue my journey. [I liked] Rebecca's funny, warm and engaging personality coupled with solid teaching of valuable skills. Being able to review the videos multiple times was awesome, as was being able to download the handouts for future reference. [There was] great follow-up and support from Rebecca as well as the chance to "meet" others learning to weave and compare notes. It has consumed way more of my time than I anticipated however it is also much more FUN than I anticipated.... well worth the cost (and even more, frankly)... Also, Rebecca's availability has been awesome. I'm really having a wonderful experience with this format! Everything about this class is superb. It is perfect for allowing me to take the time to really learn tapestry at my own pace. Thank you again for providing this opportunity to learn from you. It is a dream come true and a check off my "bucket list". I am sad it is the last day of our three-part courses, Rebecca. Even if there was a day I could not get to my tapestry weaving, I always knew the classes were there waiting for me and you were available if I had questions. Pathwright is so good and has an easy learning curve. I am not very computer saavy and had no problems using it on my iPad. Rebecca Mezoff's online tapestry class has been the "PUSH" I needed to begin using the tapestry looms I've been acquiring for the last few years. I've learned so much already! --Dawn McFall on her blog Hey Dawn. Read the entire post with photos HERE and the prior post HERE. I like how you continued to update the videos or handouts in response to specific questions people had and also posted other people's ideas. It makes the class feel like a "real" class rather than a virtual one. Your prompt feedback is also extremely valuable and made me feel like I was in a class. I am so glad I took this class. I really feel like I am gaining a solid foundation for what I hope will be years of tapestry weaving. I liked the organization of the class and the combination of video and printed material, along with Rebecca’s timely responses to questions and concerns. I thought the pacing was great, and enjoyed the opportunity to share with fellow classmates. Most of all, I thought the material was comprehensive for a first-level class of limited duration, well presented and well supported by Rebecca. It was really fun to weave along with the examples presented, and devise our own final projects based on the material in the class. This is a great opportunity to learn how to weave tapestry in a flexible, self-directed manner from a real expert. Rebecca is a warm, friendly, and skilled teacher who works very hard to ensure that her students enjoy a successful learning experience. Rebecca is an excellent teacher. She is able to see what is helpful for beginners to understand and presents the material in a nice sequential way. It was particularly helpful to see several minutes of weaving on the videos and feel the rhythm of the weaving. I became more comfortable with shoving my hand in the shed because I had seen in the video that it wouldn't harm anything. I did enjoy the "out takes".